The House Education Committee introduced a salary bill Wednesday, designed to increase spending on teacher pay by $125.6 million over five years. From left, House Education Chairman Reed DeMordaunt, Vice Chair Julie VanOrden and Rep. Steven Harris participate in Wednesday’s meeting at the Statehouse. After getting a sneak preview of draft legislation outlining the plan on Friday, the House committee voted to formally introduce the career ladder bill. Hours later, however, the Senate Education Committee killed what had been seen as a companion to the career ladder — a plan to establish tiered teacher licenses. The 33-page career ladder proposal has been revised slightly since last week, but many hallmarks are the same. Upon implementation in 2019-20, the career ladder would increase minimum teacher salaries to $37,000. Master teachers with at least eight years of experience and an advanced degree would be able to earn up to $57,500 – if they meet a series of state and local performance benchmarks. State law now sets a minimum teacher salary of $31,750. The career ladder would bring minimum salaries to $32,200 for 2015-16 – an increase of 1.4 percent. The career ladder would create two basic salary rungs for teachers. The first is a residency rung, for teachers in the first three years of their career. The second is a professional endorsement rung for teachers with three or more years of experience who meet performance benchmarks including teacher evaluations and demonstrating student growth. Residency teachers: $37,000 to $39,000. Professional teachers: $42,500 to $50,000. On top of the of residency and professional rungs, teachers with eight or more years experience who earn a master’s degree and who obtain an additional professional endorsement would earn additional pay, which is where the $57,500 figure comes in. Under the plan, all current Idaho teachers with three or more years experience would automatically enter the ladder at the professional rung and would not need to worry about advancing from residency status. For 2015-16, teacher pay at the professional level would range from $35,498 to $47,603. The ladder is designed to give all teachers a raise beginning next year and throughout its five-year phase-in, said Marilyn Whitney, Gov. Butch Otter’s education liaison. Teachers earning the state minimum this year, for example, would have their pay bumped to $33,000 next year, a 3.9 percent raise. The career ladder would replace the existing salary reimbursement grid, based on a teacher’s experience and educational credentials. If the career ladder passes, teacher salaries would still be negotiated annually between district officials and local teachers’ unions. The proposal directs $125.6 million in new state spending over five years, but the education budget would need to be set, individually, each year to fund the program. Staffers from Gov. Butch Otter’s office said the career ladder is in line with their revenue projections, meaning the state should be able to afford to fund the program fully. “We believe, barring some major event or another recession, this is a very doable implementation schedule,” Whitney said. The estimated cost for the first year of implementation is $31.9 million, essentially the same figure Otter outlined during his State of the State address Jan. 12. Last year, the State Board of Education endorsed a career ladder plan to increase minimum teacher salaries, with a price tag pegged at $175 million. The State Board plan would have increased starting pay to $40,000 in five years, or about 8 percent more than the plan before the Legislature. School administrators would still like to see teachers earn a higher minimum salary. 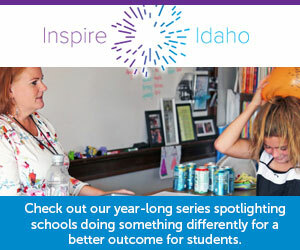 The Idaho Education Association voiced concerns after the draft was unveiled last week, saying the proposal does not go far enough or ramp up quickly enough to address their teacher recruitment and retention concerns. Educators and stakeholders have been anticipating the career ladder proposal since teacher pay was included in the 20 recommendations issued in 2013 by Gov. Butch Otter’s Task Force for Improving Education. The official proposal was negotiated during individual and small group meetings among lawmakers, state officials and education groups over the course of several weeks this session. It did not arrive in bill form until the 52nd day of the session. Winslow said school officials were concerned about aspects of last week’s draft, and the new bill addresses these concerns. He praised the bill’s architects for adding a provision that would bring noninstructional staff into the career ladder in 2016-17, if the Legislature does not address pay for counselors, librarians and speech pathologists. Whitney said bill drafters took steps to ensure teachers do not “leapfrog” more experienced educators, by obtaining a master’s degree. The career ladder will come back to House Education for a full hearing next week, at which point public testimony and debate will be accepted, said Chairman Reed DeMordaunt, R-Eagle. Two key Statehouse deadlines loom in the coming weeks. On March 12, the budget-setting Joint Finance-Appropriations Committee is scheduled to set the 2015-16 public school budget. Traditionally, any significant spending initiative — such as the career ladder — must at least pass the House or Senate before JFAC will consider incorporating it into a budget. If the budget-setting schedule remains intact, and lawmakers avoid any late-session gridlock, the Legislature could be poised to adjourn for the year as early as March 27. The career ladder would need to pass both the full House and Senate by that time, or all bets would be off until 2016-17. For months, the career ladder has been linked to another controversial proposal – a proposed rule devoted to tiered teacher licensure. But without much debate, the Senate Education Committee voted unanimously to kill the rule. After the vote, Senate Education Committee Chairman Dean Mortimer, R-Idaho Falls, said the tiered licensure rule became obsolete because it does not entirely align with the career ladder. Tiered licensure referenced and defined three certification levels, while the career ladder deals with just two — residency and professional. Although the committee swiftly rejected tiered licensure, Mortimer said his committee will “absolutely” look at the career ladder bill if it makes it out of the House. Even with the Senate rejecting tiered licensure, the certification proposal is not dead. Legislative rules dictate that proposed rules need only pass one chamber of the Legislature to be implemented. House Education could still review the tiered licensure rule and pass it. And what’s more, Idaho’s salaries are comparable to other red states, where teachers have gone on strike to protest low pay. The 2017 Legislature gave school districts and charter schools $61.9 million for teacher pay raises. But more money doesn’t always simplify the bargaining process.